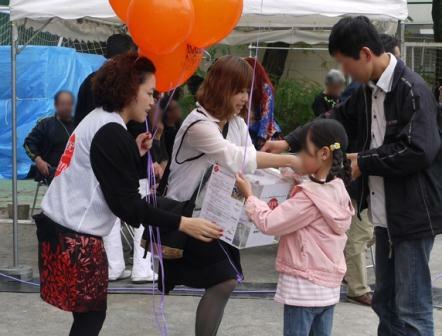 We carried out fundraising campaign at the event of Halloween, ‘BABA FEST’in TOKYO on October 30, 2011. This event had first screening of the new film "Black Jack", the Halloween ｃostume parade, cosplay photo sessions, the concert in gymnasium and more. And a various food stall village opened here, and many visitors enjoyed it. mudef gave balloons to the visitors. And they donated ￥100 to HOPE FOR JAPAN in exchange for a baloon.